Ever since we first became aware of Earth’s place in the solar system Mars has haunted the human imagination. For generations it was regarded as the most likely other place in the solar system to play host to life. 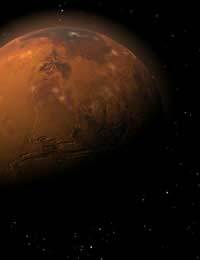 It was in the late 19th century that researchers first began to seriously contemplate the possibility that Mars played host not only to life, but to intelligent life. Italian astronomer Giovanni Schiaparelli astronomer viewed Mars through a telescope and claimed that he had seen “canali” on the surface of the planet. Although the Italian word “canali” isn’t quite equivalent to the English “canals”, Schiaparelli’s observations were crudely translated and generated much excitement in the English-speaking world. Soon others were carrying out observations of their own, producing maps of Mars which featured images of its supposed irrigation channels, and speculating about what a Martian civilisation might be like. The possibility of life on Mars continued to intrigue our collective imaginations until the Mariner probe arrived there in 1965, sending back images of what seemed to be a barren and dead world. Before long, however, it was the photographs of Mars sent back by space probes which were to rekindle interest the theories of Martian life. It was in 1976 that NASA released an image from its Voyager probe that was to give rise to new flights of fancy. Taken in the Cydonia region of Mars, it showed a curious rock formation which bore an extraordinary resemblance to a human face. The film “2001: a Space Odyssey” had been released to great acclaim only a few years before. It featured a plot in which alien artefacts had been left on the moon and in orbit around Jupiter as a kind of message to humanity. Only after achieving a certain level of technological sophistication would the human race have been able to decipher these messages. As public excitement over the “Face on Mars” photograph developed, similar speculations were being advanced. Was it a message left by aliens for us to find? NASA seemed somewhat taken aback by the public reaction to the Cydonia image and refused to take seriously the idea that it was a sign of intelligent life, arguing that the “face” was nothing more than a random rock formation which, through the chance play of light and shadow, slightly resembled a face. It was not until 1997 that another NASA probe arrived in orbit around Mars. The Mars Global Surveyor was equipped with much more powerful camera equipment than the previous Viking spacecraft, yet taking new photographs of Cydonia was not even part of the original mission plan. A vocal public outcry caused NASA to reconsider, however, and the Mars Global Surveyor was soon tasked with taking new photographs of the Face. The resultant images were in much higher resolution than before but seemed only to stir the controversy up further rather than settle it. Sceptics insisted the new photographs only confirmed that the so-called Face was nothing but an innocuous rock formation, while believers insisted that the new photographs only increased the rock’s resemblance to a face – with newly visible features including eyebrows, nostrils and teeth. One of the most vocal supporters of the Face on Mars, Richard Hoagland, believes it contains a hidden message relating to the Sphinx in Egypt. Hoagland notes that the face doesn’t look quite human. Taking one half of the face and symmetrically transposing it onto the other, he claims, produces the image of a lion’s face. Doing the same thing with the other half produces a human-like face. Hoagland notes that the Egyptian Sphinx features a human head upon a lion’s body. Perhaps, he speculates, ancient Egyptian monuments such as the pyramids and the Sphinx, together with the structures on Mars, were left by an advanced extra-terrestrial civilisation as a message to the human race. What that message might be, though, we have not yet deciphered. Supporters argue that the Face is not the only artificial structure visible on Mars. Looking elsewhere in Cydonia, they claim to see a pyramid, a fort and the remains of a ruined city. Subjecting all the lines, angles and orientations of these shapes to computer analysis, they say the scene simply does not comport with the kind of fractal-based randomness produced by natural processes. So is the Face on Mars an alien message or just a natural rock formation? Why not have a look at some high resolution images of Cydonia taken by the European Space Agency and decide for yourself?